Henri de Toulouse-Lautrec (1864  1901) was a French painter, printmaker, draftsman, and illustrator. The period he created his art was known as the Belle Époque and his focus was on the decadence in Parisian society. Toulouse-Lautrec created four posters for Bruant in 1892. This one advertises Bruant's café-cabaret at the Eldorado on Boulevard de Strasbourg in Paris. 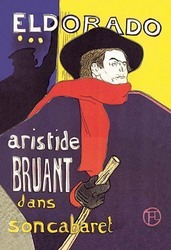 Aristide Bruant was a satirical singer who is shown here as a powerful, almost menacing figure. The poster owes its impact to the simplicity of the outlines and the palette, which comprises solid blocks of five colours. During the 1890s Toulouse-Lautrec visited the cabarets of Montmartre in Paris, producing a series of images depicting its nocturnal population.